Have you ever felt your lips begin to twitch uncontrollably? It can happen at any time and is usually not a cause for concern. If you are experiencing a twitching frequently, or if it does not stop after a few minutes, you may want to further investigate the cause. This common event can be an indicator of an underlying health condition that requires medical attention. Let’s learn what is behind lip twitching causes, and address lip twitching superstitions. Lip fasciculations, or twitching of the lips, is the involuntary sudden movement of the muscle fibers in your upper, lower, or both lips. During a twitch, it may feel obvious that people around you can see it, but that is not always the case. In addition to the muscle contractions in your lip, you may also have numbness, repeated spasms, or even the sensation of a palpitation in the lip. There is always a reason for our lips to twitch, whether from emotional distress to a neurological health condition. We will take a look at upper lip twitching causes, as well as lower lip twitching causes. In cases where we become overly excited, distraught, or completely overwhelmed, our lips may begin to tremble. The nerve endings in our upper and lower lips are stimulated by the autonomic nervous system, and its sympathetic nervous system. We also may experience pupil dilation, facial flushing, speech impediment, and watery eyes. The twitching usually lasts until we focus on the event causing the emotional reaction. Lip twitching may be a symptom of essential tremors which can affect the head and extremities. Not to be confused with Parkinson’s disease, essential tremors occur as the body’s response to muscle contractions from a neurological condition. No cause has been determined, however, those with a family history of essential tremors have a 50% chance of also experiencing these tremors. It appears usually after the age of 40, and symptoms become progressively worse over time. Essential tremors are not part of the natural ageing process. After a time period without neurostimulants such as caffeine, alcohol, or street drugs, a person can experience lip twitching. This can also happen during excessive use of such substances. Lip twitching is evident during the withdrawal period, as well as for a significant length of time after recovery. Along with the twitching, you may have tremors of the head, tongue, and vocal cords. The twitching of upper lip can be present in those with Bell’s palsy. This condition can be present after the facial nerve is damaged or injured. In addition to upper lip twitching, it can affect one side of the face with signs of drooping and swelling. Speech will also be affected by this condition. Gradual deterioration of dopamine cells within the central nervous system can cause a twitch in the upper or lower lip, or even both lips. 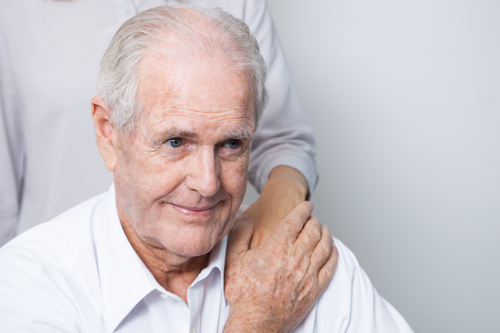 Known as Parkinson’s disease, this condition can also offer symptoms of extremity shaking, hand tremors, muscle stiffness, mobility difficulty, and speech impediment. The lips may twitch when the person is not speaking or eating in the early stages of the disease. Known as ALS, this neurodegenerative condition often presents twitching of the upper lip and face muscles as indicators. It is caused by genetic markers, biochemical imbalances, or as a result of an autoimmune disorder. The twitching relates to the beginning of the muscles gradually weakening, and will eventually result in paralyzation. Cases of hemifacial spasms identify with upper lip twitching, as well as facial muscle contractions, and paralysis of muscle-controlling facial expressions. The twitching of the lip may be reoccurring. This condition is linked to compression of the facial nerve, but no direct cause has been found. Some cases have lip twitching heightened with anxiety or fatigue. Lip twitching is a major symptom of hypoparathyroidism. This condition relates to the decrease in production of the parathyroid hormone. In addition to lower or upper lip twitching, it can affect other muscles, such as those in the hands and feet. Dry skin, brittle nails, leg cramps, and depression are other symptoms. Upper lip twitches and the movement of facial muscles are key indicators of Tourette’s syndrome. Referred to as tics, the involuntary movement of the muscles can be seen with blinking, scrunching of the nose, and clearing of the throat. Behavioral issues, involuntary vocalization sounds, and sudden obscenity yelling are also associated with this neurological disorder. Under-development of the body caused by the absence of chromosome 22 is known as the inherited DiGeorge syndrome. Twitching of the lips and other facial features are part of this condition, and may be seen at birth or later in life. Other symptoms include leg and hand muscle spasms, breathing difficulty, fatigue, or a blue hue of the skin. Depending on the underlying cause of the twitching of the lips, various treatments directly targeting the symptom may be available. If you experience lip twitching, there are several lifestyle changes you can undertake to help control the trembling. Maintain good mental and physical health by taking care of your body. Eat well, keep hydrated, and exercise regularly. Limit or avoid excessive use of caffeine, alcohol, or recreational drugs, as these substances can stimulate lip twitching. Avoid becoming overwhelmed with stress by performing breathing exercises, yoga, and meditation. During a lip twitching episode, apply pressure to the lip with the tips of your fingers to stop the trembling. You can also place a warm cloth on the lips for the same effect. Upper lip twitching means you can expect someone to kiss you in the near future; it also can be switched to meaning you may kiss someone instead. Expect something bad to happen when your left side of lip begins to twitch. Expect something good to happen when your right side of lip begins to twitch. Lip twitching can happen suddenly, and may prove to be embarrassing while in public. This involuntary movement of the muscle fibers within our lips can be a result of emotions or stress. It can also be a sign of a serious health condition or disorder. Twitching of the lips usually does not last very long in most cases, and sometimes can be stopped by applying pressure to the trembling lip with a finger or teeth. For reoccurring episodes, treatment is based on the cause. Some lip twitches can be controlled or avoided with a few lifestyle changes. “Upper Lip Twitching Causes, Meaning and Superstition,” eTopical; http://www.etopical.com/upper-lip-twitching-causes-meaning-superstition-left-right-lip-twitching-symptom/, last accessed March 23, 2017. Dr. Chris, “Lip Twitching,” Health Hype; http://www.healthhype.com/lip-twitching.html, last accessed March 23, 2017. “What is Lip Twitching?” ePain Assist; https://www.epainassist.com/face-mouth-throat/lip-twitching, last accessed March 23, 2017.